This film featured in one of my Upcoming Foreign Thrillers list a while back . I finally had the chance to watch it, and I have to say that it’s such a great film. The film starts with a man called Nils, (Stellen Skarsgard) he is on his way to pick up an award for citizen of the year, he is feeling nervous because he has to give a speech in-front of the whole town. He seems like a quiet man, who just takes pride in his job. The next day his son is found dead under suspicious circumstances. The police won’t listen to Nils when he tells them that there is no way that his son could ever die in such a way. Distraught and obviously broken, and on the verge of taking his own life, he decides to take channel his rage and takes matters into his own hands. He then decides to dish out his own relentless form of justice….on his snow-plough. The film has a great cast who all deliver stand-alone performances. 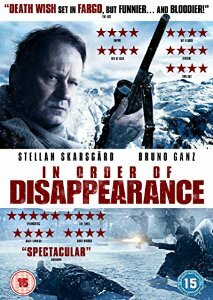 Not only is Skarsgard in it, but we also have the fantastic Bruno Ganz (Downfall) who plays the head of the Serbian crime ring. The film is wonderfully written and shot. The beautiful Nordic backdrop makes a great hunting ground for a man on a mission, in a snow-plough, seeking vengeance. As you can probably guess, there is a little bit of humour throughout, most of it coming from a character who calls himself The Count. Without a shadow of a doubt, The Count is the best thing about the film..watch him very closely, his facial impressions are priceless. He starts off thinking he’s the coolest cat in town, then his men start to go missing, and he starts to crack under the stress.. the results are hilarious.